If a co-workers calls your mobile phone, you may not recognize the phone number. Even though you can look them up in the GAL, their Caller ID won’t display a name or photo because they are not in your contacts. To learn about other smartphone contact challenges, you might read 14 reasons to sync to the GAL to smartphones. From a company perspective, placing the Office 365 GAL contacts in each user mailbox creates a little bit of magic. Every smartphone gets the correct coworker contacts. Those smartphone users now have a fully populated address book for text messaging, email and phone calls. If you would like to try this out first on a simpler scale, you can use CiraSync Personal Edition to demo GAL Sync on exactly one mailbox. Before we start, this blog post assumes that you have logged in to the CiraSync EE dashboard and setup appropriate permissions. 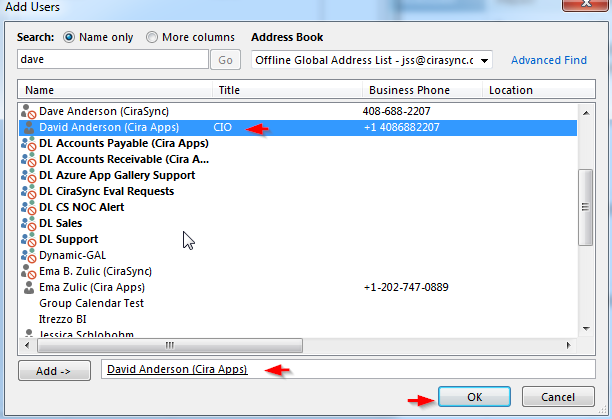 Select the source type of contacts, in this example, we will use Global Address List (2) as the contacts source. In the column on the right(5), the GAL contacts you selected are displayed. Click Next (6) located in the upper right to proceed. In this example we will set one user as a target. The search tab is automatically selected in this page. In the edit box, enter the name of a user mailbox (7). Last, click the plus sign (8) to add it to the list of targets on the right column of the wizard dialog. Click Next (9) to proceed. Option to generate smartphone contact for any GAL Distribution Lists that are included in the source.